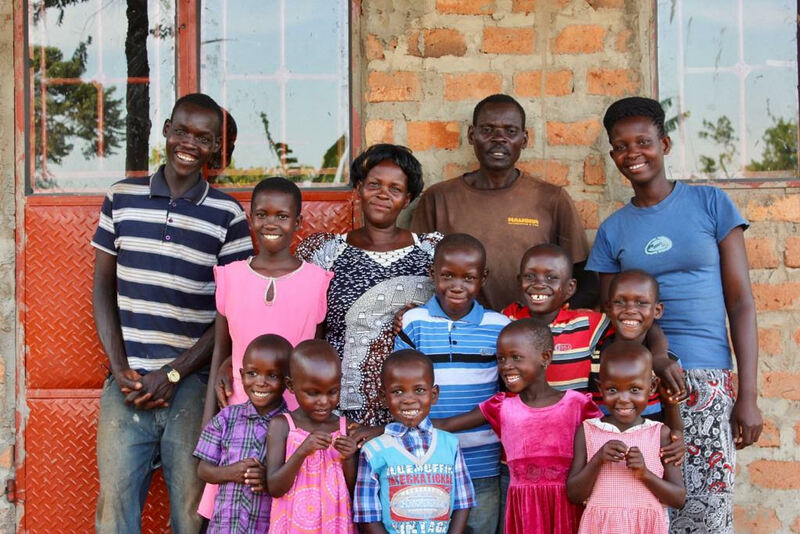 This past year, you helped make a tangible impact on the lives of two families in both Uganda and Kenya. These families were blessed with new and improved homes to call their own, helping each family improve their living conditions and provide for themselves on the land. Kato’s family has lived in Zirobwe, Uganda for over twenty years. Kato is a local manson who lives with his wife, Nalongo, and their 10 children. Kato and his family initially moved to Uganda when they were displaced from the 1986 war, but unfortunately were never able to reclaim their property, so they stayed in Zirobwe. Kato’s family was blessed with donations that helped them purchase a 2-acre piece of land for the family. Kato’s and his eldest son, George, who graduated from our sponsorship program with hands-on skills in building and carpentry had the skills to build their own home, but lacked funds for building materials. Since, they could barely afford school fees and could not afford to build a permanent home on their property, they continued to live in their mud hut that cracked bit by bit during each rainstorm. Celestine Auma’s family from Kenya, was also blessed with a new home. The Auma family has lived in the Kibera slum, the largest slum in Africa, for over a decade. Kibera is riddled with disease, drugs and despair, with little to no job opportunities. The father worked as a blacksmith but was unable to provide more than renting a shack of a room for his wife and children to share. The Auma’s owned land in the village but did not have enough funds to build a home. Through gift funds Celestine’s sponsor gave, the family was able to save and invest in building a permanent home. The Auma’s now have a home on their own land in the village. Building their home has empowered the family even more as it has allowed Celestine’s mother to farm on their land, harvesting crops to sustain the family and create some income and to save money as they no longer have to rent. The family is beyond grateful for their improved living conditions and quality of life. Your parternship has made a direct impact not only on these families, but also on other families in the village. Currently, donars are helping a grandmother and grandson build a new home so they too can transform their lives and have a safe place to live. Thank you for your generosity.